2 HEARING IMPAIRMENT ð U.S. Department of Educations statistics indicate that about 0.14 percent of the population from 6 to 17 years of age is identified as deaf or hard of hearing by the public schools. 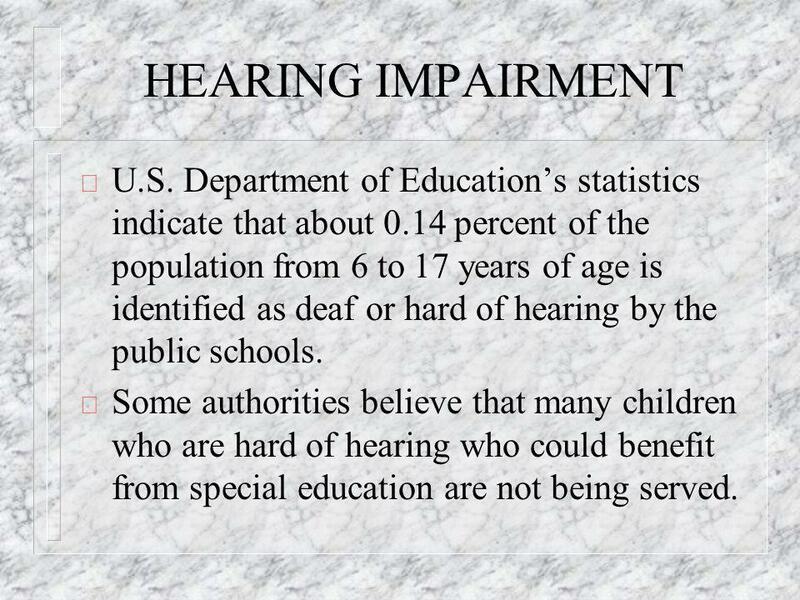 ð Some authorities believe that many children who are hard of hearing who could benefit from special education are not being served. 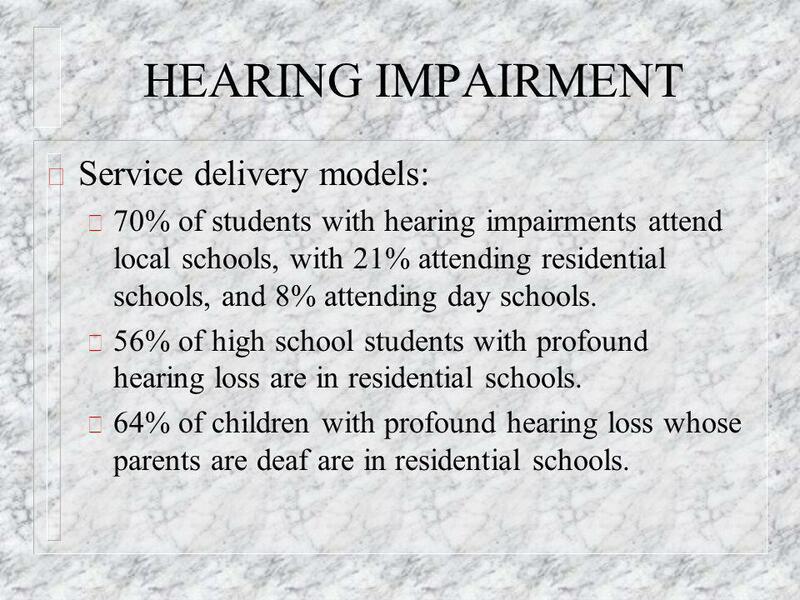 3 HEARING IMPAIRMENT ð Service delivery models: ð 70% of students with hearing impairments attend local schools, with 21% attending residential schools, and 8% attending day schools. ð 56% of high school students with profound hearing loss are in residential schools. ð 64% of children with profound hearing loss whose parents are deaf are in residential schools. 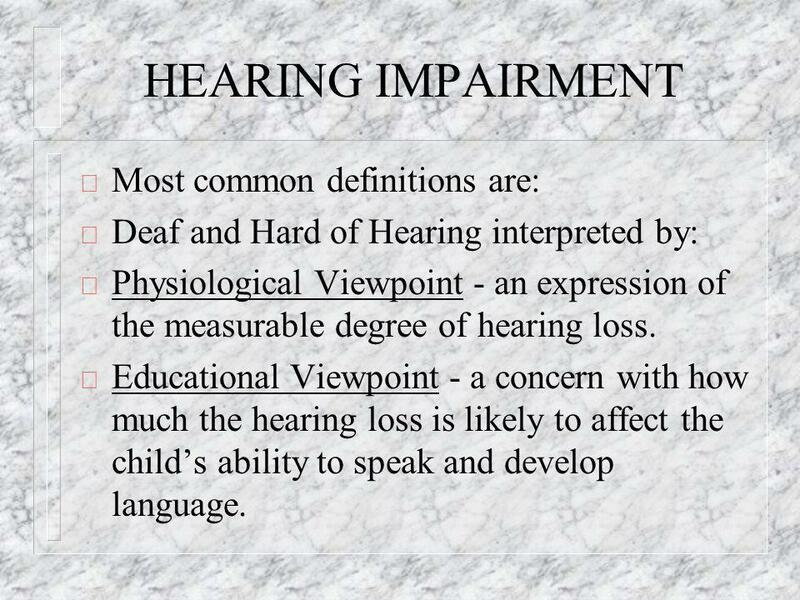 4 HEARING IMPAIRMENT ð Most common definitions are: ð Deaf and Hard of Hearing interpreted by: ð Physiological Viewpoint - an expression of the measurable degree of hearing loss. 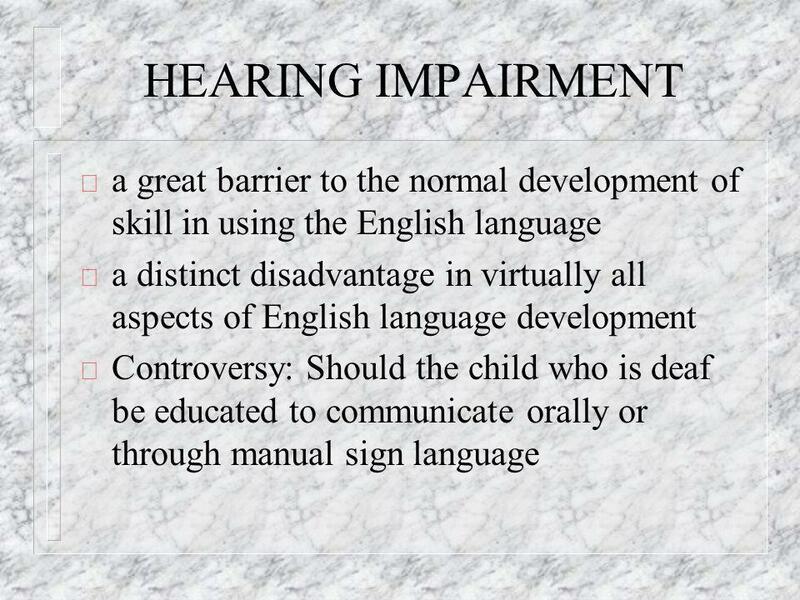 ð Educational Viewpoint - a concern with how much the hearing loss is likely to affect the childs ability to speak and develop language. 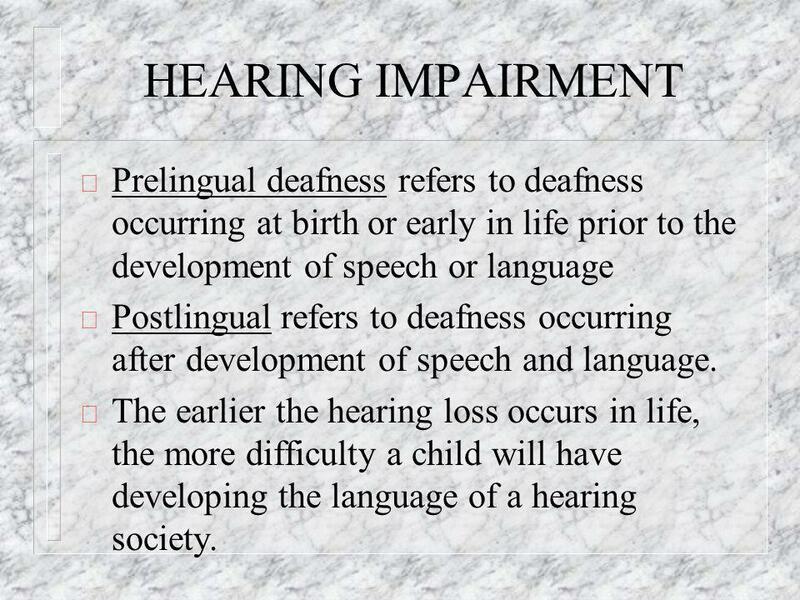 5 HEARING IMPAIRMENT ð Prelingual deafness refers to deafness occurring at birth or early in life prior to the development of speech or language ð Postlingual refers to deafness occurring after development of speech and language. ð The earlier the hearing loss occurs in life, the more difficulty a child will have developing the language of a hearing society. 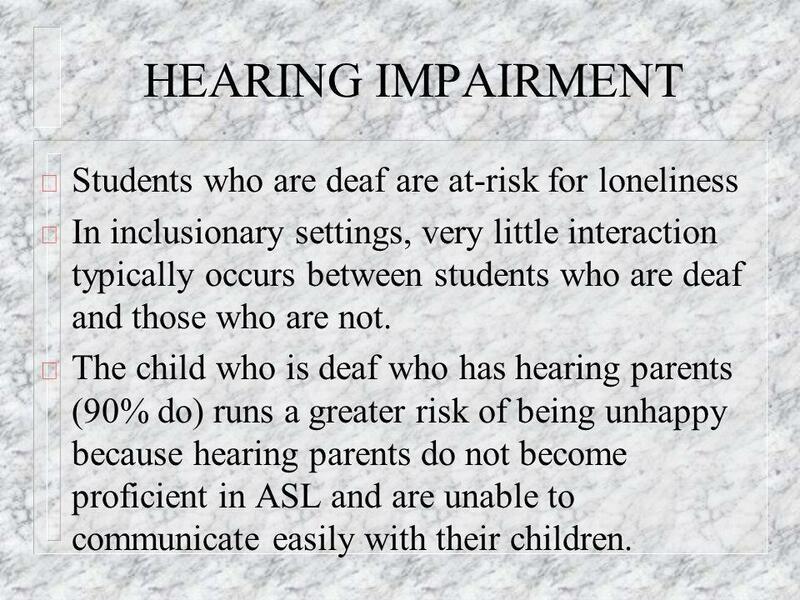 7 HEARING IMPAIRMENT ð Students who are deaf are at-risk for loneliness ð In inclusionary settings, very little interaction typically occurs between students who are deaf and those who are not. ð The child who is deaf who has hearing parents (90% do) runs a greater risk of being unhappy because hearing parents do not become proficient in ASL and are unable to communicate easily with their children. 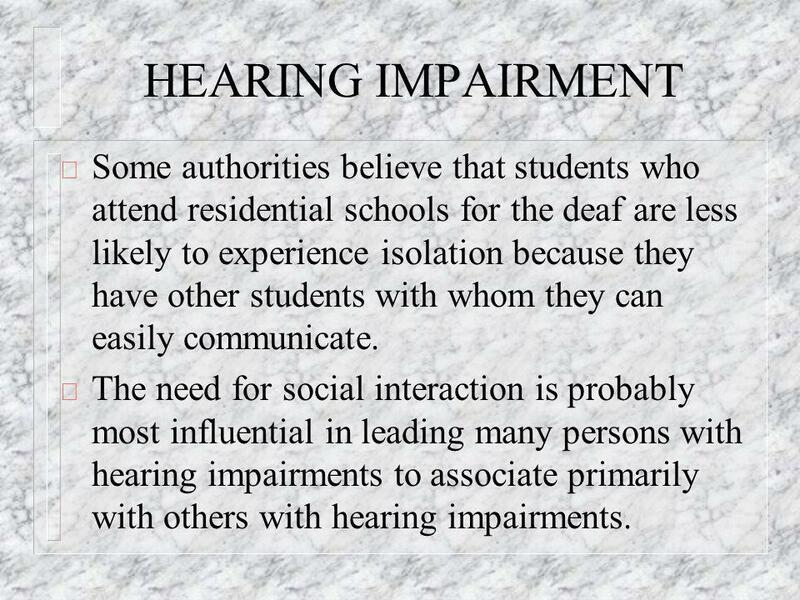 8 HEARING IMPAIRMENT ð Some authorities believe that students who attend residential schools for the deaf are less likely to experience isolation because they have other students with whom they can easily communicate. ð The need for social interaction is probably most influential in leading many persons with hearing impairments to associate primarily with others with hearing impairments. 9 HEARING IMPAIRMENT ð There is a growing sentiment among people who are deaf that deafness should not even be considered a disability. 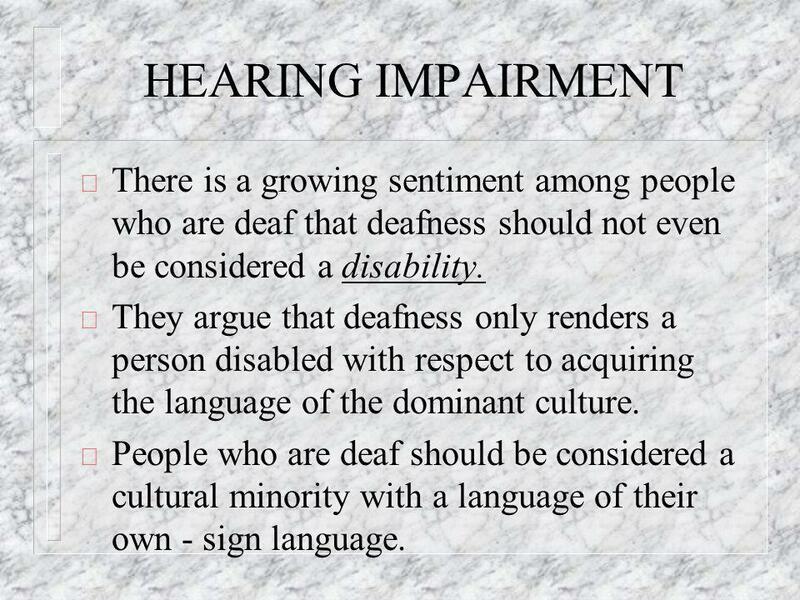 ð They argue that deafness only renders a person disabled with respect to acquiring the language of the dominant culture. ð People who are deaf should be considered a cultural minority with a language of their own - sign language. 11 HEARING IMPAIRMENT ð Regarding linguistic differentiation, most authorities view the Deaf community as bilingual, with individuals possessing varying degrees of fluency in ASL and English. ð Attitudinal deafness refers to whether a person thinks of himself as deaf. It may not have anything to do with a persons hearing acuity. 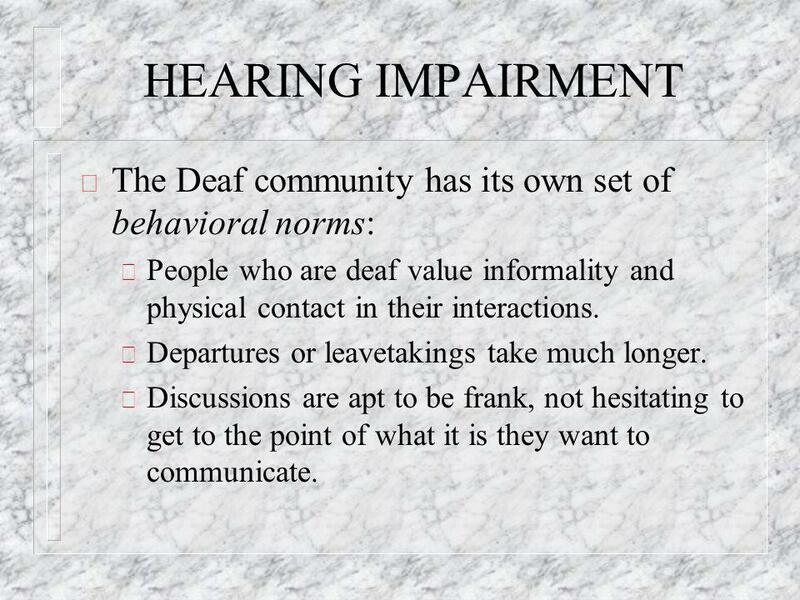 12 HEARING IMPAIRMENT ð The Deaf community has its own set of behavioral norms: ð People who are deaf value informality and physical contact in their interactions. ð Departures or leavetakings take much longer. ð Discussions are apt to be frank, not hesitating to get to the point of what it is they want to communicate. 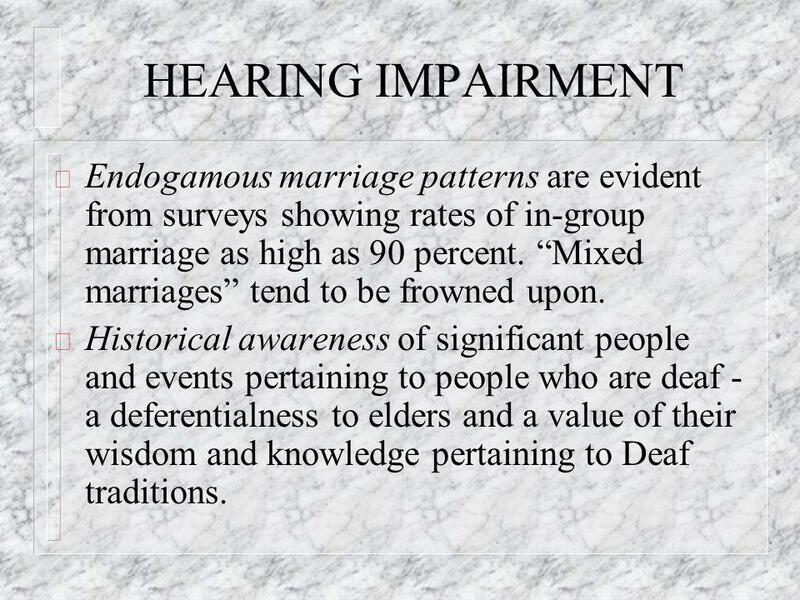 13 HEARING IMPAIRMENT ð Endogamous marriage patterns are evident from surveys showing rates of in-group marriage as high as 90 percent. Mixed marriages tend to be frowned upon. 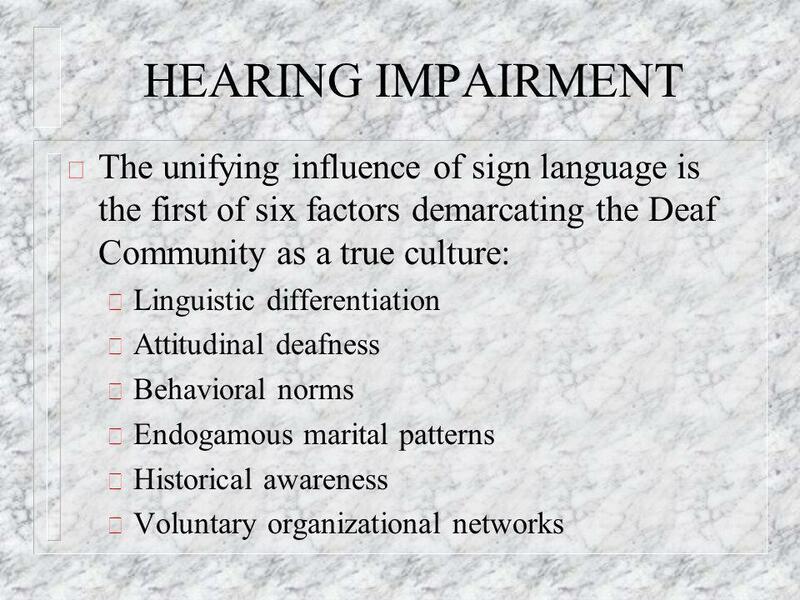 ð Historical awareness of significant people and events pertaining to people who are deaf - a deferentialness to elders and a value of their wisdom and knowledge pertaining to Deaf traditions. 14 HEARING IMPAIRMENT ð Auditory-verbal approach stresses using techniques designed to encourage children to make use of what hearing they possess. 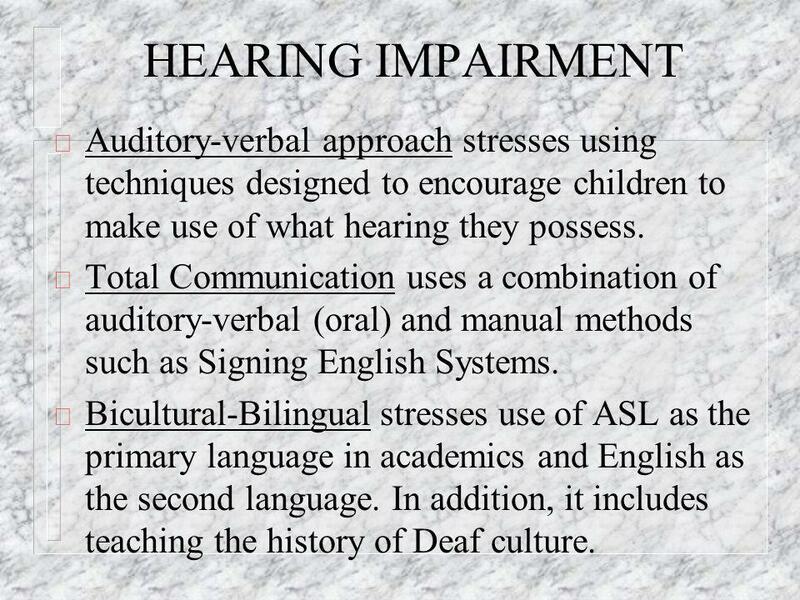 ð Total Communication uses a combination of auditory-verbal (oral) and manual methods such as Signing English Systems. ð Bicultural-Bilingual stresses use of ASL as the primary language in academics and English as the second language. In addition, it includes teaching the history of Deaf culture. 15 HEARING IMPAIRMENT ð Inclusion in general education classes runs the risk of making students who are deaf feel isolated. 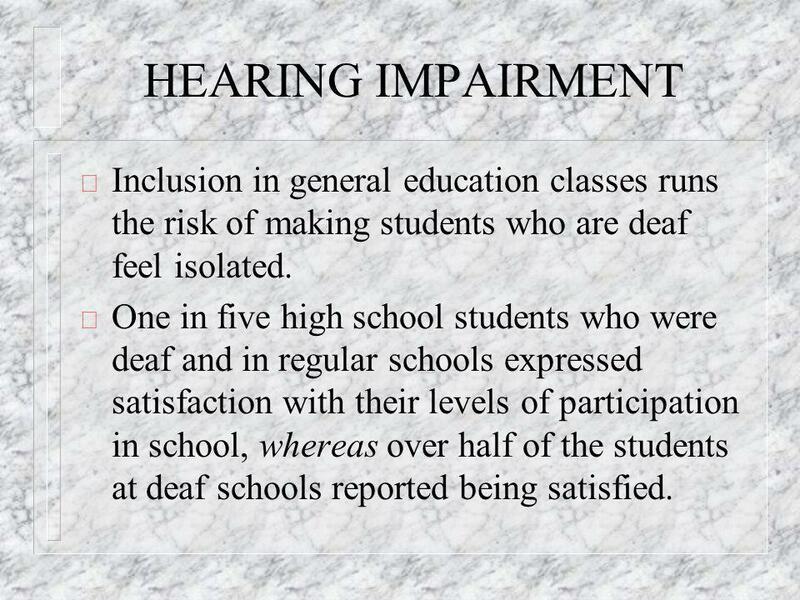 ð One in five high school students who were deaf and in regular schools expressed satisfaction with their levels of participation in school, whereas over half of the students at deaf schools reported being satisfied. 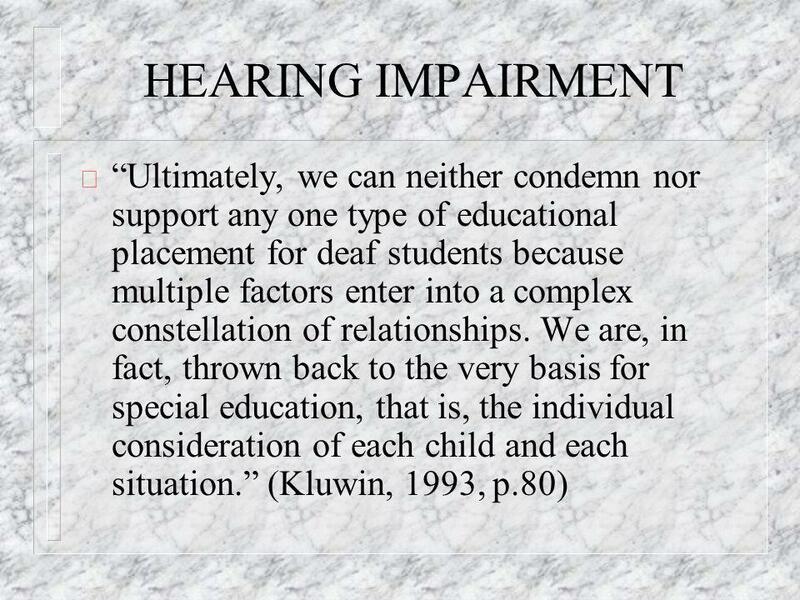 Download ppt "HEARING IMPAIRMENT ð Ultimately, we can neither condemn nor support any one type of educational placement for deaf students because multiple factors enter." Deaf Education Two Perspectives Jack Slemenda, Jr. Converse College #350-#550 Spring, 2001. Ch.3. Who is “family” to you? Defining Family A broad definition of family includes: The traditional family definition (parent and child), Intimate partners. 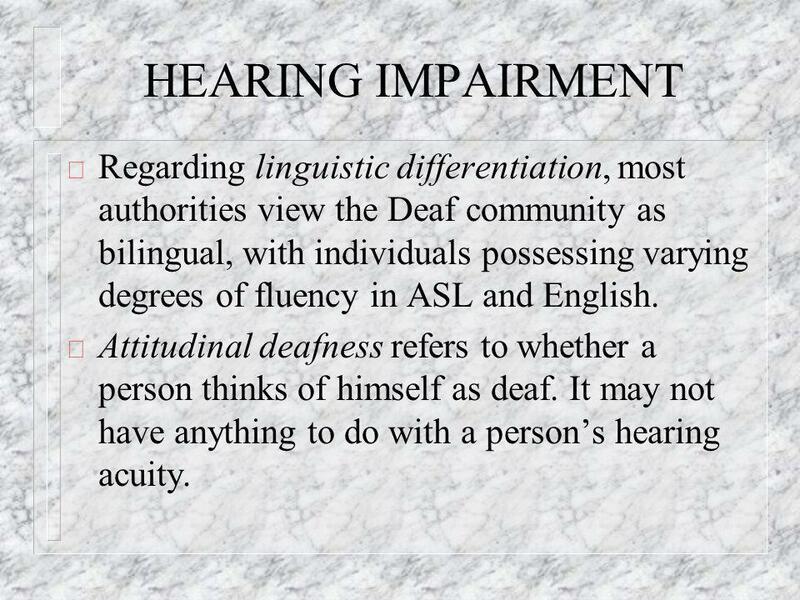 Chapter Eleven Individuals with Hearing Impairments. ASL should be the first language of deaf students, and English should be taught as a second language through the use of ASL. The end goal is that students. Hearing Impaired. Definition Includes both deaf and hard of hearing Hearing loss interferes with or adversely affects educational performance. CSD 3000 DEAFNESS IN SOCIETY Topic 1 DEAFNESS & HEARING LOSS Definitions, Prevalence, & Myths. CSD 5400 REHABILITATION PROCEDURES FOR THE HARD OF HEARING Hearing Loss and Identity Psychosocial Aspects Personal and Social Effects. Chapter Ten Individuals With Speech and Language Impairments.